We spent Christmas Eve checking out the newly re-opened 2nd Avenue Deli, which is now located in the shadow of the Empire State Building on 33rd and 3rd Avenue in Manhattan. Those familiar with this New York institution will not be disappointed. 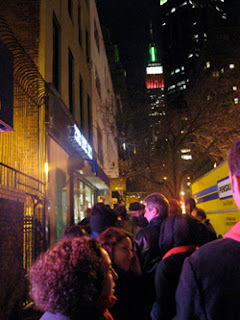 The hour we spent waiting on line in the winter cold was well worth the matzo ball soup and pastrami sandwich we chowed down on one we were inside! (Slate accurately described the opening as the "Jewish Woodstock" and Save the Deli had a wonderful post about the opening here.) Can't make it down to the deli in person? 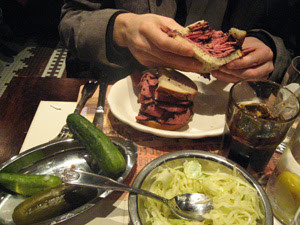 Be sure to check out the 2nd Avenue Deli Cookbook at PopJudaica.com.